SUITE 1 • Second floor loft suite with king sized bed and 2 Juliet balconies overlooking beautiful Main Street. Great for watching the world go by. The suite has a kitchenette and the bathroom features a large walk in shower. There are 13 stairs up to the suite. 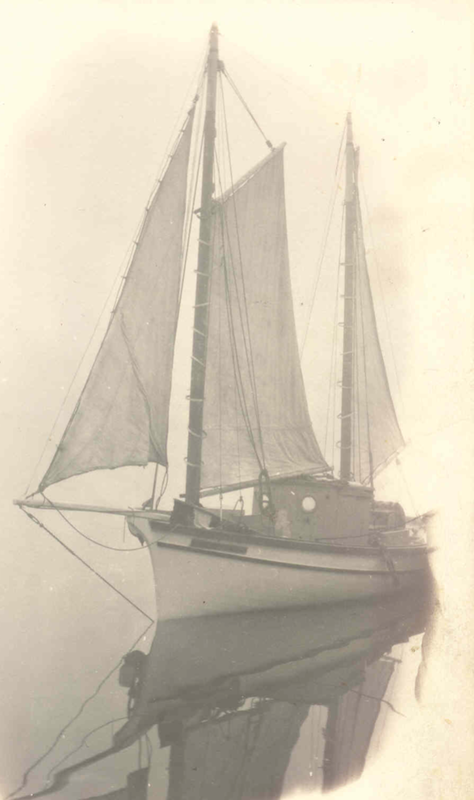 The Helen MacLeod 11 was the last sail powered “Huron Boat” on the Great Lakes. In a barn, just north of Bayfield, sits the Helen MacLeod 11, the last classic, “Huron Boat”. An irreplaceable piece of Great Lakes marine heritage. The last sail powered commercial fishing vessel in this part of America. She was launched on the banks of the Bayfield River in 1926 by the family of Hugh MacLeod, one of Lake Huron’s pioneer fishermen, who started fishing from Bayfield in the 1860’s. They managed to incorporate the best features of all the Huron boats plus some of their own innovations into the Helen MacLeod 11. She has hull lines that make the heart of a sailor beat faster. She is a 38 foot, square sterned, two masted wooden fishing schooner. Best features of all the Huron boats were incorporated into the Helen MacLeod 11. She was sailed out of Bayfield harbour by Captain Louie MacLeod until 1945 and when he could no longer sail his beloved Helen MacLeod 11, she ended up with various owners including Detroit’s Dossin Great Lakes Museum. She was allowed to deteriorate by various owners until 1996, when, the Prothero family, assisted the Bayfield Historical Society in purchasing the vessel and bringing her home. Ultimately, like Nova Scotia’s ‘Bluenose’, the ‘Helen MacLeod 11’, could be a wonderful marine heritage icon, a symbol for Great Lakes environmental understanding, a business development ambassador and tourist attraction. Unlike a ‘Tall Ship’, its size makes it transportable by road and it could be moved to many different venues. The dream of seeing this Bayfield and Great Lakes icon restored has never died for several members of the Bayfield Historical Society, some of whom are descendants of Lake Huron fishermen. Hundreds of this type of boat fished our Great Lakes and now there is only one left, the Helen MacLeod 11.